I am pretty chuffed about this visit: I received one of the University of New South Wales (Sydney) Distinguished Visiting Scholar awards and will be giving some talks and a workshop, as well as meeting loads of people during my time in the Southern hemisphere. It’s not a big surprise that my talks and workshop will focus on media theory, materiality and history. In the workshop, or “master class”, we will be reading key texts of German media theory, especially focusing on the concept of cultural techniques. 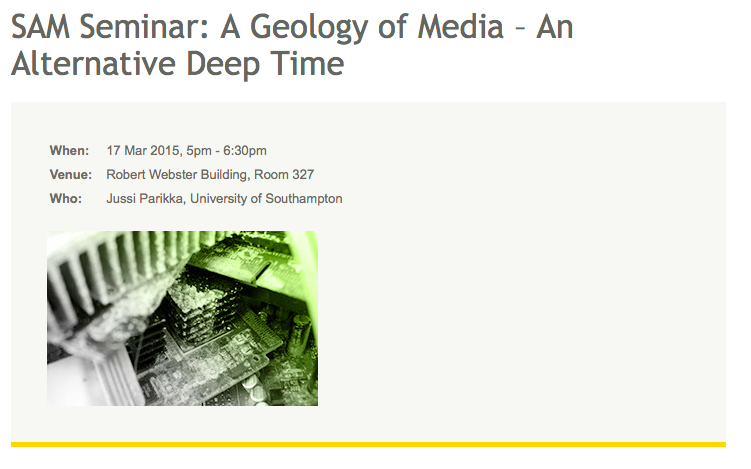 One of the talks (on March 17) will be on the geophysical materialities of media in art and technology, “a story less about extensions of Man than extensions of the planetary.” It’s a preview of the forthcoming book A Geology of Media. In addition, another talk (March 16) is an early attempt on what might become a research/book project together with Lori Emerson and Darren Wershler on humanities labs/media archaeology labs. Below is the abstract for that. Thanks to Tom Apperley at UNSW for coordinating and facilitating the visit. For any queries related to the talks, contact Tom. This talk will address media archaeology but from the angle that considers it as a spatialised, institutionalized practice. By addressing existing and emerging media archaeology labs such as in Berlin, Boulder (Colorado) and other places, it aims to offer ideas how to contextualize the idea of “labs” in contemporary humanities. Media archaeology labs are often pitched as a way to think cultural heritage and contemporary technology outside the more established institutional practices of archives and museums. Instead, the labs seem to have become sites of “hacking”, opening up technologies and pedagogical ways of appropriating past technologies as epistemological ways of understanding modern technological culture. Besides offering examples and introduction to some key ideas and practices, the talk aims to expand to artistic practices and other cross-disciplinary ways of humanities knowledge-creation.